We can't wait to cruise to Africa in 2020. Our itineraries include ports-of-call in eleven different African countries, including Namibia, South Africa, and Kenya. In honor of these exciting travel plans, we're conducting Q&As with three Azamara crew members who call African countries home. You can read our Q&A with Liesl, of Namibia, here, and our Q&A with Almé, of South Africa, here. Joining us for this interview is Philip Herbert, Hotel Director. You grew up in Kenya. What part of the country are you from? Yes, I was born and raised there for the younger part of life, and then moved to the United Kingdom. But my family is still there. I was born in Nairobi, the capital of Kenya, and grew up in a town just north of Nairobi called Nanyuki, which is right on the equator. As you’re coming into the town there is a sign that says “You are now crossing the equator” and it's also iconic because it's where Mt. Kenya is, the second tallest mountain in Africa. I was there until I was nine and then went back every year after. How long have you been with Azamara Club Cruises? I started in November 2007, and Azamara itself actually started in May 2007, so I’ve been here since the beginning. I started on the Azamara Journey and then in 2010, I moved to the Azamara Quest – which was just at the time where we were rebranded as Azamara Club Cruises. Ever since I’ve been here I’ve been Hotel Director, which is responsible for the largest department onboard. My responsibilities and duties are to make sure the hotel operations run as smoothly and efficiently as possible and to make sure guests have a wonderful cruise experience so they leave the ship really happy. Super excited. I’ve been pushing and trying to get us to go to Africa for a very long time. I'm absolutely over the moon because Africa can be a really life-changing experience. Also, I still have my father, brother, uncles, and aunts there so I’m very very excited for them to come and see the ship. What was it like, growing up in Kenya? Well as a young boy being in Africa with all of this wildlife, my parents were farmers so we grew up with wildlife right at our doorstep, so you would wake-up in the morning and see giraffes crossing the plain, so as a kid it was incredibly exciting, I have an older brother and a younger sister and we were out all the time, so I felt very lucky to have a very privileged childhood. The local wildlife in Kenya is pretty much unmatched. What’s your favorite animal? And why? That’s easy, I would say a cheetah because for some time I house sat a neighbors cheetah. It was amazing because they also a dog and a pet cheetah and at the end, I was actually bitten by the dog and not the cheetah. 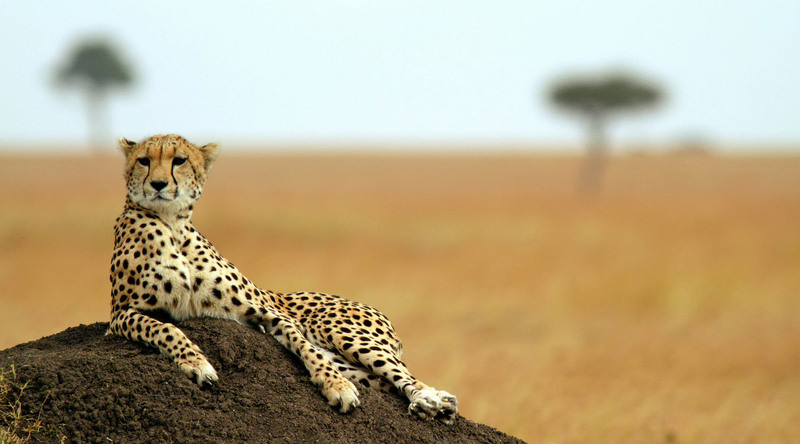 This cheetah was named Duma, which is actually the Swahili word for Cheetah. He was in this pen, and when I got close to the pen for the first time you can just hear this really loud purring. He purred so loud it was like an engine, and he would be pacing back and forth. It was just fascinating. He would of course always try to come into the house to lay on the couch, I would walk him and the dog together and he would go hunting. He wasn’t too good at that because he was very fat. [Laughs.] I spent a year at this house and ever since then I’ve had an affinity towards these animals. In 2020, Azamara is sailing to several maiden ports in Africa, including Mombasa, Kenya. What do you think guests will enjoy most about visiting Kenya? I would say the people. Incredibly welcoming and friendly people, like anywhere else in the world. The people you come across are incredibly warm and incredibly friendly. Every country has friendly people but I feel like there is something special there, genuinely really really warm and welcoming people. What do you think will surprise guests the most about Kenya? The scenery. Kenya is about the size of Texas, and the weather along the coast of Kenya is very much like Florida, it is hot and muggy. And when you’re in Nairobi the night time is cool, where I grew up it's also chilly, so you get this dry heat. Within a couple hours, you can go from mountain to desert to sea to lakes. Beyond Kenya, we’re also sailing to several ports in South Africa in 2020, as well as ports in Madagascar, Zanzibar, and Mozambique. If you were booking one of our 2020 Africa itineraries, which of these destinations would you most look forward to? Why? I would say 100% go to South Africa, and especially Cape Town. Cape Town is a must-see city. It’s a cross between California and the South of France in terms of climate, and that fact that they have these beautiful vineyards with absolutely great wine. The dining, the hospitality, it's by the ocean, it's just a beautiful destination. Especially with the views of Table Mountain throughout the city. I think that fact that we will be taking guests to locations where some of these big ships cant dock. And, the fact that people have a little bit of hesitation about going to Africa, so it's great that guests will also have a chance to explore and come back to their home, the Azamara Quest. For a lot of people that’s really reassuring and a very tempted proposition. Find out more about all our African cruises, and our itineraries calling on Mombasa, Kenya.